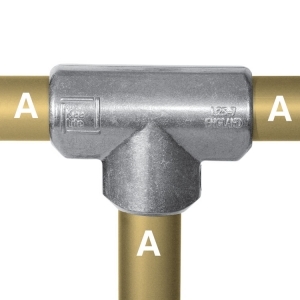 Commonly used as the 90°joint between the top rail and an intermediate upright on safety railing. 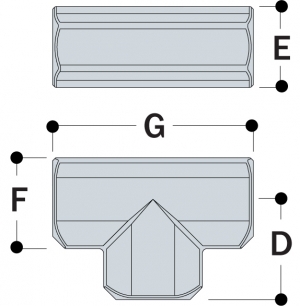 As there are two socket set screws in the sleeve, this fitting can be used where a join is required in the horizontal tube. 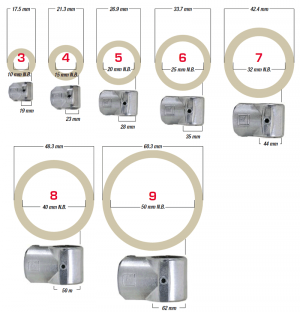 The Type L10 fitting can be used as an alternative when a join in the tube is not required. L25-6 0.46 lbs. 6 2.05 in. 1.65 in. 1.97 in. 4.09 in. L25-7 0.77 lbs. 7 2.56 in. 2.09 in. 2.32 in. 5.12 in. L25-8 1.12 lbs. 8 2.91 in. 2.36 in. 2.56 in. 5.83 in. L25-9 2.05 lbs. 9 3.54 in. 2.91 in. 3.07 in. 7.09 in.